The Free For All returns to Sidney Harman Hall to kick-start the 2010–2011 Season with 22 free performances of William Shakespeare’s Twelfth Night, which The Downtowner called “gorgeously romantic… as brand new as a first kiss.” This event is a much-loved Washington tradition, offering free, world-class performances of Shakespearean classics to more than 575,000 D.C.-area residents. Considered one of Shakespeare’s greatest comedies, Twelfth Night ponders love lost and found. A shipwreck separates twins Viola and Sebastian, but tragedy quickly turns to comedy when they wash up in a land turned upside-down by love. With raucous antics, ravishing language and rich characters, Shakespeare creates a bittersweet tale of laughter and longing. Directed by Alan Paul, with original direction by Rebecca Bayla Taichman. Join Friends of Free For All! It costs STC, a not-for-profit theatre, nearly $700,000 to present Free For All each year. But with the support of hundreds of generous Friends, STC has brought free, world-class Shakespeare productions to D.C. audiences for the past 20 years. Enjoy home ticket delivery, premium reserved seating, special events and much more when you join Friends of Free For All. Membership begins with a tax-deductible gift of $150 or more and includes four tickets to Twelfth Night. To join Friends or for more information, please click here or call 202.547.1122, option 7. The easiest way to visit Sidney Harman Hall is by taking Metro, the area’s extensive and easy-to-use public transportation system. Sidney Harman Hall is a block from the Gallery Pl-Chinatown and Judiciary Square stations. For metro maps and times visit wmata.com. people may start lining up at least four hours before the show. Please arrive early to increase your chances of receiving a ticket. Popular events at the Verizon Center can increase traffic on the Metro. Please check the Verizon Center calendar at VerizonCenter.com/events before heading out and plan extra time on days with concerts or games. As part of our Free For All commitment to bring free theatre to the D.C.-metro area, we plan several outreach efforts that may affect the number of seats available to the public each night. We host “Ward Nights,” where D.C. council members and their ward constituents are invited to specific performances. We also host large school groups for some performances through Students for Shakespeare. Because of these reserved groups, certain performances will have fewer seats available, so your patience is appreciated as we reach out to the D.C. community. Tickets can be obtained free of charge in person the day of the performance at the Sidney Harman Hall Box Office. We begin distributing tickets two hours prior to curtain (please note that curtain times vary, so check our website for each day’s schedule). Each person in line is allowed up to two tickets. Tickets are first-come, first-served and subject to availability. Seating is assigned and will be at the discretion of House Management. Please be flexible about not sitting with friends. With such a high-demand show, it is not always possible to seat large groups together, so please be flexible. Join Friends of Free For All and receive reserved seating and in-home ticket delivery benefits (see page 27). To learn more about reserved seating for school and youth community groups, read about Students for Shakespeare at ShakespeareTheatre.org/education. I have a ticket! Now what? After receiving your tickets, you will probably have time to eat before the performance. Food and beverages are available in the ground floor lobby while you wait in line for tickets. Full concessions bars are open in the Orchestra and Mezzanine lobbies pre-show and during intermission. Avoid long lines at intermission by pre-ordering food and beverages for the break. You can also go to one of the many restaurants in Gallery Place/Chinatown within walking distance of the theatre. However, no outside food or drink is permitted in the lobby. Most importantly, you must be in your seats no later than five minutes to curtain or you may lose your seat. At five minutes to curtain, House Management fills all open seats with patrons who are waiting outside with vouchers. What do the numbered vouchers mean? Once the tickets for each performance have been given out, we will distribute a select number of numbered vouchers to the remaining patrons in line. If patrons with tickets do not return five minutes before curtain, we will begin to seat those with vouchers in numeric order until there are no more vacant seats. How can I reserve tickets ahead of time? All 2010–2011 Season subscribers and Friends of Free For All may reserve Free For All tickets in advance for select performances. Anyone may join Friends of Free For All by making a tax-deductible contribution to support this important outreach program. Subscribers are eligible for two tickets, but the number of tickets that Friends of Free For All may reserve varies by level of giving. Is the Free For All family friendly? 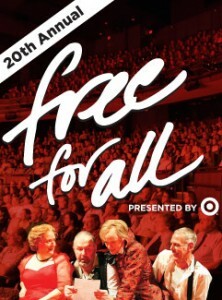 The Free For All is recommended for people ages 10 and older, although anyone can come. While this is a family-oriented event, we do not have an official crying room. Guardians should bring children out into the lobby if they are restless. In conjunction with the Free For All, the Target Family Fun Fair is an event that is completely family friendly.